HMS Forth (P222), the first of the Royal Navy’s next-generation of Offshore Patrol ships has been formally commissioned into the Fleet. Held at her home base of Portsmouth, the commissioning ceremony for HMS Forth (P222) represents the second ship to join the Royal Navy in less than six months. After the aircraft carrier HMS Queen Elizabeth (R08) in December, HMS Forth (P222) is the next generation of warships to arrive as part of the government’s £178bn plan to give the Armed Forces the equipment it needs over the next decade. She is the first of five new Offshore Patrol Vessels (OPV) designed for counter-piracy, anti-smuggling, fishery protection, border patrol, counter terrorism and maritime defence duties. 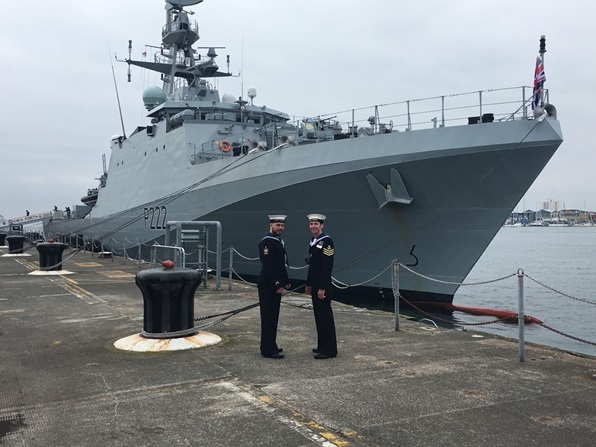 Commanding Officer, Commander Bob Laverty, said: «It’s a privilege to be the Commanding Officer of HMS Forth, the first in class of the new Batch 2 Offshore Patrol Vessels. The body of work being put in by my ship’s company will be reflected in not just one, but all five brand new platforms being delivered to the RN and these fantastic ships will be a fine addition to the fleet. They are a highly capable and versatile warship and I am immensely proud of the effort and sacrifices all have made that have allowed us to be here today». The commissioning ceremony lasted for just over an hour and guests included the Lady Sponsor Rachel Johnstone-Burt, First Sea Lord Admiral Sir Philip Jones, Fleet Commander Vice Admiral Ben Key and Assistant Chief of the Naval Staff Ships Rear Admiral Chris Gardner. Classified as Batch 2 River-class OPVs HMS Forth (P222) and her sisters – HMS Trent (P224), Medway (P223), Tamar and Spey – are a significant upgrade on HMS Tyne (P281), HMS Severn (P282), HMS Mersey (P283) and HMS Clyde (P257), which were designed and built 15 years ago. With HMS Forth (P222) entering service this year the remaining four ships are all expected to arrive in Portsmouth by 2020. They will become the Royal Navy’s eyes and ears around the UK, helping to safeguard fishing stocks, reassure and protect the Falkland Islands and are capable of deploying to the Mediterranean and Caribbean to safeguard the UK’s interests around the world. Paddy Clayton, deputy head of the Defence Equipment and Support (DE&S) OPV Project Team, said: «The team at DE&S is extremely proud to see HMS Forth’s commissioning. We will continue to work closely with our delivery partners throughout UK industry and our customer as the remaining four ships in the new fleet are delivered into Royal Navy service». Designed for a total crew of around 58, but requiring only 34 to go to sea, she can spend up to 320 days a year on operations. The larger crew allows a rotation of personnel to ensure they get to spend time at home or on training. 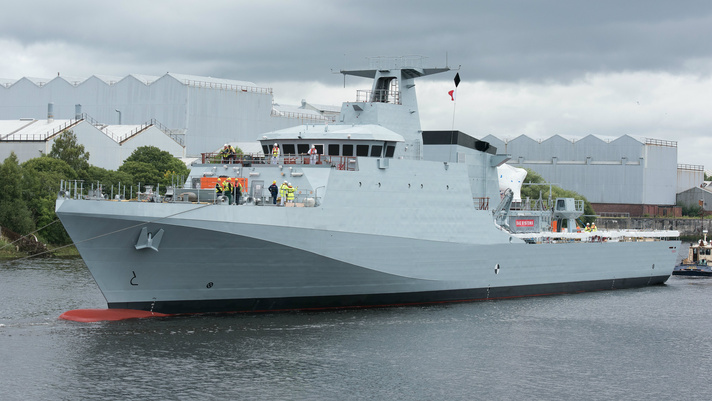 Built by BAE Systems at their base on the Clyde, the new OPVs are four knots faster than their predecessors at 24 knots/26.6 mph/44.4 km/h, have an increased range of 5,500 NM/6,329 miles/10,186 km, have a 30-mm automatic cannon as their main armament instead of a 20-mm gun, two Miniguns, four machine-guns and are equipped with two Pacific 24 sea boats. The new OPVs will be supported at Portsmouth Naval Base by BAE Systems, initially under the terms of the manufacturing contract. Guto Bebb MP, the recently appointed UK Minister for Defence Procurement, visited BAE Systems’ Clyde shipyards today to announce the formal acceptance of the first River Class Offshore Patrol Vessel (OPV) by the Ministry of Defence and witness progress on the Type 26 programme as production started on the second hull section of Glasgow, the first of the City Class frigates. Defence Minister Guto Bebb said: «Thanks to the hard work of the Clyde shipyards, HMS Forth (P222) is now ready to join the Royal Navy surface fleet and begin the vital task of defending the UK and her interests around the world. Developing the Type 26 capability is also making great strides forward, reflecting the UK’s commitment to this cutting-edge new warship, which will sustain 4,000 jobs in Scotland and right across the UK». 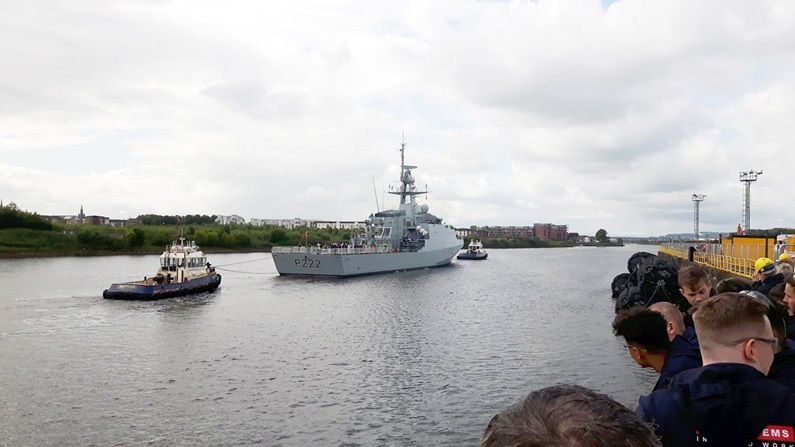 HMS Forth (P222) will remain at the Scotstoun yard in Glasgow for a short period to complete some additional work requested by the MOD and on departure will be the first complex warship to leave Glasgow since HMS Duncan (D37) in 2013. She is expected to be commissioned into Her Majesty’s fleet at her home port of Portsmouth Naval Base this year. HMS Medway (P223), the second of class, was named in October 2017 and is set to depart for sea trials in the first half of this year, while HMS Trent (P224) will be formally named in the spring. 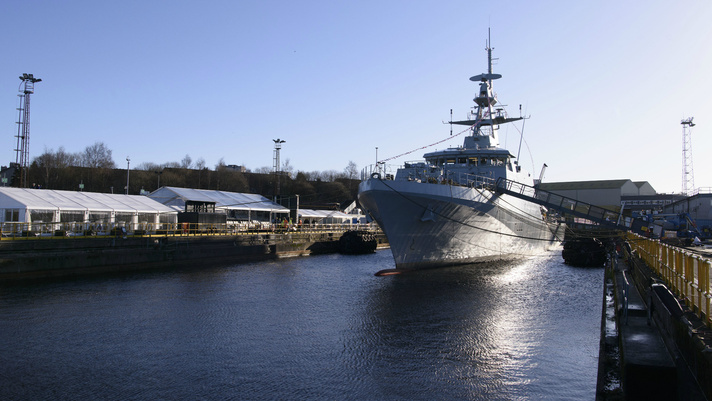 Tamar and Spey, the last of the River Class OPVs are currently under production at BAE Systems’ Govan yard. Iain Stevenson, BAE Systems Naval Ships Managing Director, said: «It has been a pleasure to welcome the Minister to our facilities today and we were proud to show him around HMS Forth (P222). She is the first of a very special class of ships that we know will provide the Royal Navy and her crew with the flexibility they need to perform their vital operations. We are equally proud of the progress we are making on Glasgow, which is the first of three contracted next generation City Class Type 26 frigates. We are committed to supporting the Royal Navy through the delivery of these ships plus the five River Class OPVs, while we continue to work with our partner Cammell Laird to bid for the Type 31e contract». During the visit BAE Systems also announced the signing of a £5.6 million contract with General Electric to establish an Electrical Integration and Test Facility in Whetstone, Leicestershire, to enable critical de-risking integration tests for the Type 26 propulsion systems. The agreement, which follows a previous Design Development contract signed in 2016, brings the total committed investment in the facility to around £13 million. With a cutting edge platform design and the ability to adapt to the requirements of different navies, the Type 26 design has been proposed for the Australian Government’s anti-submarine warfare frigate programme and the Canadian Surface Combatant programme. 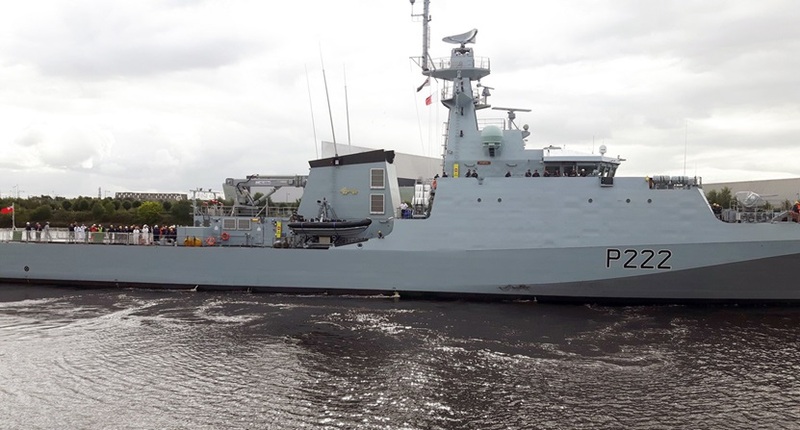 The first of the Royal Navy’s (RN) next-generation patrol ships HMS Forth (P222) is at sea as she sailed down the Clyde for the first time on August 31. HMS Forth (P222) leads a class of five state-of-the-art warships which will act as the RN’s eyes and ears around the United Kingdom (UK), help to safeguard fishing stocks, reassure and protect Falkland Islanders and deploy to the Mediterranean and Caribbean if necessary. Designed for a crew of just under 60 (but needing only 38 crew at any one time to go to sea), the ship departed Scotstoun – where she’s spent several months being fitted out – on August 30 afternoon with a maximum number of 110 souls aboard. Every bunk aboard is filled. Contractors from builders BAE Systems, experts from the military’s support organisation Defence Equipment and Support (DE&S), the RN’s equipment trials specialists Maritime Capability Trials and Assessment (MCTA) and ship’s company will guide HMS Forth (P222) through her ‘contractor sea trials’ to see how she handles and how the equipment on board performs. Although she’s classed as a Batch 2 River-class Offshore Patrol Vessel (OPV), HMS Forth (P222) and her sisters – HMS Medway (P223), HMS Trent (P224), HMS Tamar and HMS Spey – are a big leap forward from HMS Tyne (P281), HMS Severn (P282), HMS Mersey (P283) and HMS Clyde (P257), which were designed and built 15 years ago. They’re four knots/4.6 mph/7.4 km/h faster, carry a 30-mm, not 20-mm main gun, two Miniguns, four machine-guns, two Pacific 24 sea boats. Each ship is equipped with a flight deck (only HMS Clyde (P257) of the first-generation craft can host a helicopter) and there’s accommodation for up to 50 troops/Royal Marines to support operations ashore if needed. Junior ratings share six-berth cabins – as on Type 45 destroyers; senior rates and officers will live in two-berth en suite cabins. HMS Forth (P222), which is affiliated to the historic city of Stirling, also borrows many of the first batch’s features – which were revolutionary in RN ships at the time: fixed fire-fighting systems across much of the ship, a computer-controlled machinery monitoring system. The bridge is far more Type 45 (spacious, computerised with interchangeable displays, communications kit) than a rather cramped Type 23 frigate. «Today marks a key moment in the generation of the ship and it is extremely exciting to be on board», said Commander Bob Laverty, Forth’s first Commanding Officer. «Forth boasts state-of-the-art equipment, and my Ship’s Company are looking forward to developing their knowledge of the systems on board with their industry counterparts». The Batch 2s are from the same family as the Batch 1s «but are a completely new design», Lieutenant Tom Sleight, Forth’s Navigator, explained. «The design provides a lot more operational flexibility with the large flight deck and space for the embarked force. These ships will be able to conduct all of the fishery protection and domestic security duties currently undertaken by the squadron but will now also provide far more capable platform for deploying overseas such as when HMS Mersey (P283) provided support to migrant operations in the Mediterranean or HMS Severn (P282) and HMS Mersey (P283) on Atlantic Patrol North. They are going to be extremely capable ships when compared with their predecessors». Ship No.2, HMS Medway (P223), has taken Forth’s place at Scotstoun for fitting out having been floated down river from Govan in mid-August. HMS FORTH (P222), the first of the five new River Class Offshore Patrol Vessels (OPV), was officially named on March 9, 2017, during a ceremony at BAE Systems’ site at Scotstoun in Glasgow in this important year for the Royal Navy. Guests watched as Mrs. Johnstone-Burt, HMS FORTH’s sponsor and wife of Vice Admiral Tony Johnstone-Burt, the Master of the Household to the Sovereign and former Chief of Staff to NATO’s Supreme Allied Command Transformation, named the 1,800 tonne, 295-foot/90-metre-long vessel. In keeping with tradition, Mrs. Johnstone-Burt smashed a bottle of locally-distilled whisky from the Deanston Distillery near Stirling, the city affiliated with HMS FORTH (P222), against the ship’s hull. Minister for Defence Procurement, Harriett Baldwin, said: «As part of a sustained programme delivering world-class ships and submarines, HMS Forth’s naming is a vitally important part of the Government’s ten-year £178 billion plan to provide our Armed Forces with the equipment they need. From counter-narcotics operations in the Caribbean, to securing the UK’s borders on patrols closer to home, the Royal Navy’s new Offshore Patrol Vessels will help protect our interests around the world». Iain Stevenson, Managing Director of BAE Systems Naval Ships, added: «Today’s naming ceremony is an immensely proud occasion for each and every person involved in the design and manufacture of HMS FORTH (P222) for the Royal Navy. It’s easy to forget that the she started life as a flat plate of steel in the winter of 2014, yet just over two years later she is afloat at Scotstoun, with the latest technologies and combat management systems, ready to depart for sea trials later this year». HMS FORTH (P222) will embark shortly for sea trials where she will be put through her paces in the open waters off the coasts of Scotland. With a crew of 58 HMS FORTH (P222) is expected to enter service with the Royal Navy in 2018. The bottle of whisky was provided by Deanston Distillery near Doune, selected due to its close proximity to Stirling – the city that HMS FORTH (P222) is affiliated with. A bottle of its award-winning 12-Year-Old fine single was smashed off the ship’s hull by HMS FORTH’s Lady Sponsor, Mrs. Rachel Johnstone-Burt. The 90 meter OPV is based on a proven BAE Systems design, which is already in service with the Brazilian Navy and Royal Thai Navy. Engineers at BAE Systems have modified the design to meet the requirements of the Royal Navy in support of UK interests both at home and abroad. The OPVs will be globally deployable and capable of ocean patrol with a range of in excess of 5,000 nautical miles/5,754 miles/9,260 km and a maximum speed of 24 knots/27.6 mph/44.4 km/h. The vessels will include a modified flight deck capable of operating the latest Merlin helicopters, larger stores and more accommodation for embarked troops. They will also be the first ships to be built with a BAE Systems’ designed operating system called ‘Shared Infrastructure’. The Shared Infrastructure hardware solution provides a smart, easily-updatable warship operating system loaded onto a single console.